The Melodic, a 4 piece, folk-pop band out of South London recently released their debut EP, On My Way, with Anti. Using instruments like the Charango, Melodica and Kora (most of which I have never of heard of ), The Melodic have created a fresh new addition to the folk genre. Title track “On My Way”, is instantly captivating from it’s very first notes. The music has a happy melody, sure to cure even the sourest of moods. The boy/girl vocals are fantastic, light and airy. It’s one of my favorite songs right now. Check it out below. After reading Ben’s text, I jumped on Spotify and listened to Birthdays for myself. It is just how Ben described, “…the most simple but elegant music…”. Check out “You” (below), one of the standout tracks from the album. The song consists mostly of 24 year old Henson’s soft, but powerful voice, accompanied mostly by guitar, with a few more stringed instruments sprinkled throughout. Birthdays was released by Anti at the beginning of April. It’s an intense album. I highly recommend it. Thanks for the tip Ben. Now this is my cup of tea, or more appropriate, my cup of soup. An album named after food. Ya-ka-may is a type of New Orlean’s street food: a noodle soup typically made with shrimp, chicken, roast beef, and almost always a hard boiled egg. Galactic reproduces the multi-ethnic spirit of ya-ka-may on record. The band pulled in a not so disparate mix of artists and sounds from the New Orlean’s music scene into one steaming hot platter of bouncing funk. Everyone from such legends as Allen Touissant (The Meters) and the Rebirth Brass Band and up-and-comers Trombone Shorty and John BouttÃ© plunk down their unique sound into Galactic’s oh so tasty stew. The band generously offers up three tracks from the album, so listen in and if you dig it, expand your palate and buy it. I know this one’s a few years old but this is such the un-Muggs album and perfect for this moody time of year. Muggs is best known for the venomous hooks behind all your favorite Cypress Hill and House of Pain joints, as well as collabos with various hip-hop all-stars under the Soul Assassins umbrella. On 2003’s Dust though he pays homage to his less obvious influences such as Pink Floyd and brought in some lesser known vocalists in Amy Trujillo and Josh Todd. Dusted, natch, but broadly accessible. He’s a little bit country; he’s a little bit rock ‘n’ roll; he’s a little bit hip-hop. He’s straight outta Brooklyn. He’s Tim Fite. Basically, Mr. Fite builds songs around hip-hop loops and beats, infusing the tracks with folk’s lyrical sensibilities. “Away From the Snakes,” for example, follows country’s song template: “I lost my dog, I lost my wife, I lost my money.” Then, on “No Good Here,” he’ll fracture an upbeat, diddy-of-a-riff, with rock’s explosive power. Consider him Beck’s East Coast brother-in-arms, ten years later, but mining the same, largely untapped source of urban-folk gems. If cursing offends, beware. If cursing delights, dig in. Michael Franti is the one of those rare singers whose boomin’ growl can start a party as quickly as it can a protest (probably about time for him to update his 1992 cover of “California Uber Alles“). His latest Spearhead joint comes on the heels of his self-booked trip to Iraq, which is documented on the DVD I Know I’m Not Alone. His experience, which included performances for U.S. soldiers and Iraqi families alike, clearly shaped the album’s compassionate (“I Know I’m Not Alone”) and passionate (“Yell Fire”) flavors of rebellion. 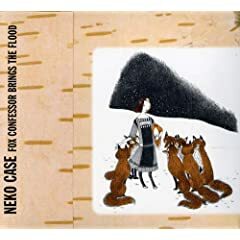 Itâ€™s already been established (see below) that I canâ€™t even attempt neutrality when talking about Neko Case. Iâ€™m in love with her, plain and simple. Iâ€™m married, but I think even my wife understands, or at least as much as I can understand her love for Zach Braff. But donâ€™t let my bald adoration turn you away, because itâ€™s Nekoâ€™s mind you should love, man. Her mastery of lyrical storytelling is nearly in a league with Johnny Cash, Loretta Lynne, Emmylou Harris, and Willie Nelson, and â€œnearlyâ€ only because she hasnâ€™t been around as long. The angelic tenor of her voice, rendered with a ballroom echo, is sublime, and the stories themselves possess the exquisite detail and suspense, the juxtaposition of familiarity and esoteric conceit, of the finest Flannery Oâ€™ Connor tales. And donâ€™t forget that, lest you complain (and, really, itâ€™s the only complaint Iâ€™ll accept about my beloved) that the sonic similarities between tracks is a hair too close, Neko is pushing the boundaries of American roots music by night while she and the New Pornographers keep inching toward the perfect pop song by day. Iâ€™m well aware that this is the kind of adoring write-up that could come back to haunt me. Oh well. Love makes us do crazy things.